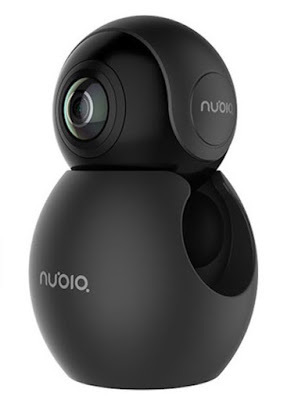 ZTE subsidiary Nubia Technology announced a 360 camera accessory for its Android phones called the Nubia NeoAir. The NeoAir has two 210-degree fisheye lenses, realtime in-camera stitching for photos and videos, and attaches to smartphones via a USB Type C port. Nubia said the NeoAir will retail for around $100. If the NeoAir looks familiar, that’s because it appears to be a rebranded version of the Insta360 Air, probably similar to how Huawei and Insta360 created a variant of the Air called the Honor VR. However, unlike the announcement for the Honor VR, the announcement for NeoAir did not mention Insta360. I don’t know whether NeoAir will use the Insta360 Air’s software, or will benefit from forthcoming updates to the Air including realtime image stabilization. Thank you very much to videographer Tony Anastasi for bringing this to my attention!